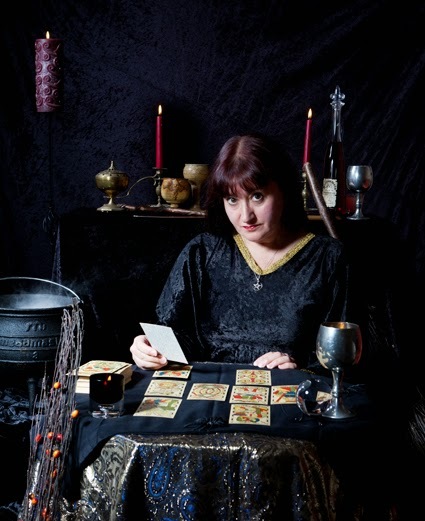 A bad witch's blog: Are Some Tarot Decks More Genuine Than Others? Are Some Tarot Decks More Genuine Than Others? To get discussion going on my blog, here's a question about Tarot decks. Are some decks more genuine than others? This question came up after Kevin, who reads my blog, commented on my review of the Sherlock Holmes Tarot Deck: "Love the artwork on these. But to me, all these alternative oracles and card decks, however fun they are, don't ring true. "If the tarot is simply the user projecting their own thoughts and meanings onto the cards then I suppose one deck is no different to any other. However, if there is any true arcane power in the original symbols then it is lost here." My reply at the time was that I'd question whether older decks are necessarily more powerful or magical than some more modern ones. I gave one example: "The Crowley/Thoth deck is full of arcane symbolism, but is rather different to the Visconti-Sforza tarot deck, which is I think the oldest known deck. There are some decks that look pretty and are sold to card collectors more than serious readers I suspect, but I wouldn't write off all modern decks with new symbolism just because they are modern." Kevin replied: "My personal belief is that there are certain symbols and rituals which do inherently carry power and that the "anything goes" approach leads to placebo effects, self-delusions and ultimately disappointment with the practices when no results are achieved." There are, of course, a huge variety of Tarot decks available these days. Probably the most commonly used is the Rider Waite. As I mentioned earlier, the Crowley Thoth Tarot is another classic, while among the oldest is the The Visconti-Sforza Tarot. One of my favourites is the The Greenwood Tarot. Sadly I don't own a copy and it is very rare, but I do have the similar Wildwood deck. Some recent decks I've reviewed and which have widely different pictures include the new Guardian Angel set, the Animal Wisdom Tarot, the Victorian Steampunk Tarot and of course the Sherlock Holmes Tarot. But what do you think? Are there certain symbols that inherently carry more power when it comes to Tarot decks? Are older decks more effective than modern ones? Are they more genuine? What is your own favourite deck and which do you find the best Tarot set to use for effective readings? I suppose this question depends on what you believe in Tarot. If you think that the interpretation of the names of the cards gives the reader the answers then the design needn't matter - they could be blank cards with the printed names, such as Hanged Man or Tower. If, however, you believe that the pictures are part of the inherent "power" of a Tarot pack then the images on the cards count as part of the magic. It's a similar question to the function of rune stones - are the runes on the stone the most important factor, or is it the material that they are made of? The shortest question, but a complicated and inherant question is ... what counts as genuine? Surely if someone feels drawn to a deck, and it works for them, then that's the right one for them to use whatever anyone else says? I use a modern tarot deck I was drawn to. The power of the tarot is in the user not the cards, they are just a prop for you to draw on. Caroline Wise asked me to put her comment here on her behalf. She said: "I tried to sign up to answer but google wanted way too much information about me so I'll answer here! Most important is that the reader gets accurate results and meaningful insights from the deck they prefer to use. I work with the Greenwood tarot as the artist was a close friend and I saw the pictures manifest and understand the artist's personal mythology, so it works for me. To me it is more of an oracle than a 'tarot', a real gateway into the inner worlds via nature mythology and the cycles of the year and life and death. It can definitely be used as a tarot. For a more direct tarot reading I can't get a better result from any but the Smith-Waite which was devised by an occultist in 1909. The modern commercial trend to have a 'tarot of everything' can be distracting, the cards should be a way to explore the client's question, and have particular symbolism to facilitate that. The modern decks are so self-consciously about a particular popular theme have heavy handed symbolism instead of subtle and obscure occult symbolism that works away at a sub-conscious level. If the client has a serious or distressing issue about life or death, silly cats and TV characters could appear frivolous and inappropriate. Having said that, Sherlock Holmes could work well on the inner planes solving problems as he is brilliant detective! On another tack, The oldest tarot decks were not used in the way we use them today,so in a way the question of authenticity is irrelevant. Before the advent of the easily available commercial decks, rich and poor women alike did accurate readings with playing cards mainly." The Thoth has always been difficult to read for me, but a cheap bookstore RW deck has always been spot on, likewise for the Robin Wood Tarot. I can't explain it, but it does seem to me that some decks speak clearly, perhaps those that are closer to the original symbolism. Desert Astrologer - I also use the Robin Wood deck. It was the first deck I bought and, like you, I find it gives really accurate readings. The Screaming Cards are a fine deck in my opinion. Like many tarot readers I've got more decks than sense. Most of them I've bought because of the lovely artwork. I doubt I'll ever use my Baba Studios Alice tarot because I don't want to crease it! For serious readings I'm more likely to go to my RWS deck than anything else. We've lived together for almost 30 years, so it's like going to an old friend for wise advice. For me the symbols work as a stimulant to the unconscious mind as well as the collective unconscious, helping me to tap into hidden wisdom and to connect to magical energies on the inner planes (I follow a shamanic path). Divination is important in my practice and different methods (or tools) have varying results. Scrying into a mirror, pool or crystal ball works in a different way for me than tarot, and again the runes (different levels and depths that is), but I'm sure this is peculiar to the diviner. I can understand the magical connection of creating your own tarot deck. I made my own runes many years ago and have a strong connection to them. But equally it could have been I bought a set and became attached to it instead, and there would have been nothing wrong in that. Being familiar with the chosen tool though, I feel helps in the divining process. However, with absolutely no artistic ability at all, I use the Mythic Tarot I bought years ago, and having made a connection to it, would be loath to buy a new set. It's more of a personal choice and accuracy generally depends I feel on other elements. But a divination tool that distracts you or that you can't connect with (so in itself this is a distraction) perhaps isn't the right one to use. The one I use the most at the moment is Farrell and Wendrichs Golden Dawn Temple Tarot, not only is it accurate but it lends itself very well to other workings, especially those aligned to the GD tradition. I have been a witch for over 20 years and have many packs of tarot (they seem to pup). I choose what I am drawn to and what makes sense to me pictorially. I need to see the "story" when I am reading. The ones I use are all accurate regardless of the symbols. I believe the power comes from the reader, not the cards. But there is a kind of placebo effect surely, if you believe the symbols are powerful would that not make it so? In magic, belief is everything. Dotty - I'm like you and have several decks. I also agree that belief is vital in magic - and the placebo effect is something rather wonderful and not fully understood. In our post-modern world, consistently working with a set of tools probably matters a lot more than using tools of any traditional or received tool design. Innovation and creativity ought to be honored in magic as much as continuity and doing things in some "old way." I have an Egyptian deck, a dragon deck, and one that came with a book about learning the tarot, and while the art is beautiful on the first two decks, I can't "read" the images, whereas I can with the set that came with a book. I suppose part of it comes from the fact that it's intended to help people learn to read them but ultimately I can't help thinking it comes down to what works with a person's own set of associations. Caroline Wise "wisely" said most of what I was going to say. I'll just add that the Tarot was adapted for esoteric study during the Occult Revival in the kate 19th century, led by Papus, Eliphas Lévy, and the Golden Dawn. In that context, the cards are aids to contemplation and ascension. There is a G.D. method of Tarot divination, but it cannot be used by anyone without extensive preparation. The images of the Tarot came out of a cultural milieu that was saturated in Hermetic (alchemical) symbolism, so a Renaissance deck or a Waite-Smith deck will have its images that invoke powerful archetypes, even though they are old-fashioned and we don't maintain their "Triumphal" order in society any more (thank the stars!). This allows them to speak to any reader as an oracle deck. That use, however, leads one onto the path where anything is an oracle to someone skilled in divination, and nothing is to one who is not.